That portion of the interview has mostly escaped the attention of media covering the event as coverage zeroed in on the U.S. Air Force’s plans for the Pacific pivot, which was also discussed at length. If General Carlisle is right, it would mean that Singapore will become the fourth operator of the F-35B, after the United States Marine Corps, the United Kingdom and Italy. A densely populated island nation sitting at the southern tip of the Malay Peninsula, Singapore sits at a choke point along the vital sea lines of communications between the economic powerhouses of East Asia with the Middle East and, further afield, Europe. Its deepwater port is the lifeblood of a booming economy, while world-renowned Changi International Airport serves as a vital Asian air hub for travellers throughout the globe. With so much to defend and so little strategic depth (the main island measures just 723 square kilometers or approximately 277 square miles), Singapore has responded by building a powerful military, widely regarded as among the best in Asia. 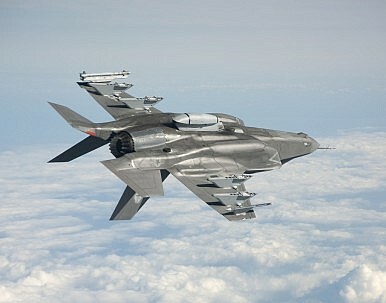 Singapore joined the F-35 program in February 2003 as a Security Cooperative Participant (SCP). As an SCP, Singapore is believed to be able explore configurations of the JSF to meet its unique operational needs and form its own program office. However, the island nation’s interest in the STOVL variant started to catch the eye only in 2011, when Rolls-Royce revealed that Singapore had launched studies aimed at considering the F-35B. Having the United States and Australia, both of whom have close defense ties with Singapore, also planning to operate F-35s in the neighborhood, it would be no surprise if Singapore was keen to follow in their footsteps. Together with Japan’s (and possibly South Korea’s) aircraft, the type’s network-enabled capability and integrated sensor suite is a definite plus for interoperability with allied F-35s in the event of a need to conduct joint operations in the region. Notoriously secretive about its military matters, defense officials in Singapore have neither confirmed nor denied the reports about its interest in the F-35B. However, Defence Minister Ng Eng Hen had previously gone on record a number of times to say that Singapore is evaluating the F-35 for the Republic of Singapore Air Force’s (RSAF) next fighter, but that no decision has been made. General Carlisle’s remarks are the first indication of the direction Singapore’s Ministry of Defence will be taking with regards to an initial purchase.